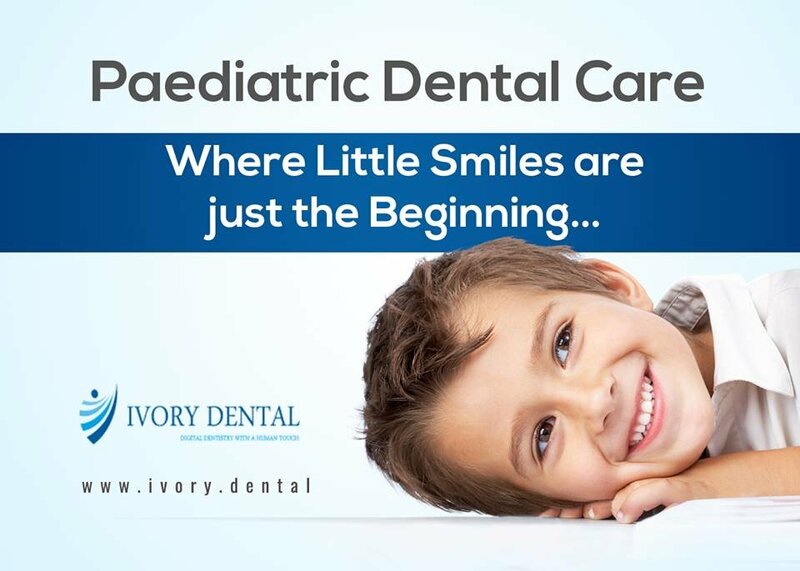 Ivory dental clinic offers pediatric dental care services using most advanced painless techniques from best-skilled dentists and care. We ensure the usage of safest anesthesia recommended for children, administered by a qualified anaesthetist, to ease the nervousness and discomfort caused during dental treatment procedures and to relax the child throughout the treatment. Nitrous Oxide sedation, also called as laughing gas is a blend of Nitrous oxide and oxygen and is administered through a breathing mask placed over the child’s nose. This puts the child in fully conscious state and keeps all normal impulses, but the child does not feel any pain or discomfort during the treatment. Here we are listing on treatment services performed for diagnosing and treating various problems in paediatric dental health care. Fluoride therapy is a protective measure, wherein fluoride is applied directly to the teeth to protect them from dental cavities. The therapy also involves repairing of the infected or decayed tooth and involves incorporation of fluoride to the damaged tooth to prevent further decay and infection. Sealants are another method of protecting the teeth from decay and cavity formation. Sealants are the safest and effective protective method and use a coating on the biting surfaces of the back teeth. This coating forms a hard shield on the surface of the teeth and acts as a fence against the bacterial infection and prevents decay. Pit and fissure sealants are usually applied to the back teeth (molar and premolar teeth) to cover the grooves and fissures. The sealants are applied after cleaning the teeth and left to set hard. Restorations involve filling or repairing damaged or decayed tooth to restore their function and appearance. This includes cleaning and filling composites on a decayed tooth, placement of Crowns on the damaged tooth surface, filling the gaps between teeth and application of sealants to prevent further damage to the teeth. Tooth pulp comprises of the nerves and roots at the centre of the teeth. A bacterial infection damage the root and nerve ending causing decay and damage to the teeth with severe pain. The pulp therapy involves removing the affected pulp and filling with resorbable calcium hydroxide filling to prevent further bacterial infections. Pediatric orthodontics is a treatment plan customized for healthy growth and development of the child teeth. The procedure includes rectifying the developmental issues of the permanent teeth, improving oral cavity health, aligning permanent teeth development in case of misplaced or crowded teeth, reducing and preventing the risk of teeth damage with non invasive orthodontic or dental treatments. Space maintainers are used if the baby tooth is lost prematurely and the permanent tooth is not ready to erupt in position. They hold the space for permanent teeth and prevent over-crowding of teeth. At Ivory dental clinic, we rely on laser devices for minimal invasive and less pain during various treatments with no bleeding and zero downtime. The laser-assisted treatment techniques enables faster recovery and healing period with no pain, swelling and discomfort during and after the procedures. At Ivory dental clinic, we provide special care and attention to kids who walk into our clinic and they step out with zero pain and discomfort caused by dental problems. We accentuate on excellence and quality in services by a team of well-experienced and qualified dental surgeons at affordable rates. To know your children dental care and treatment cost, book an appointment now.